#MakeADalekMakeAFriend / Doctor Who Swap: The Pieces I Made! Last week I shared the package I received as part of the #MakeADalekMakeAFriend Doctor Who swap I participated in. This week I am sharing the pieces I made for my partner! I wanted to try something new and different for this swap, because you know, I HAD to! I’ve seen many Doctor Who inspired quilts and I really wanted my partner to have something a little different. So I opened up EQ7 and designed a ROUND mini quilt. It was a bit different AND it helped feed my urge to sew more curved seams. I printed out my pattern as a template, which was a first for me. I’ve never pieced using a bunch of separate templates. I’m use to paper piecing or basic shape piecing. I loved the outcome, but I’m not sure if I’m sold on the technique yet. I’ll keep trying though, because maybe the timing just wasn’t right. haha. 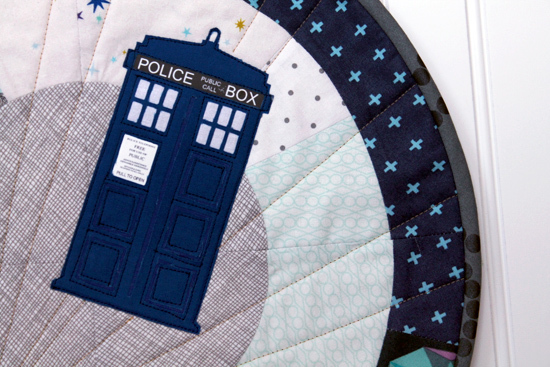 Anyway, back to the mini quilt… It is 16″ across and I used fabrics found in my stash, with the exception of the Tardis. I had to order some Kona Cotton in Royal for that piece. I used my Silhouette Cameo and some Sewable Interfacing to make the applique, and some Dark Fabric Tshirt Heat Transfer for the Police Box sign. I am in love with the way the Tardis came out! I wanted to go the next step and personalize the quilt with my partners name in Gallifreyan (the language of the Time Lords/The Doctor). I downloaded a “translator” and uploaded the image into my embroidery software. I then embroidered it onto the quilt at a random spot on the bottom left corner. I was so excited about this part, well, until I posted about it on Instagram and was kindly told it wasn’t written correctly!!!! It was embroidered with several layers of lines so removing it would most likely ruin that section of the quilt. I was upset, but figured it would make for a funny story when I wrote this blog post! I even wrote my swap partner a little note explaining it all. After the embroidery fiasco, I went ahead and quilted it all just using straight lines that radiate from the “name” using the same thread. I then bound the entire piece using bias cut binding, that was hand sewn on the back. It’s the same binding I used on the Quilted Table Topper from last week. I just loved it on that piece so much, I had to use it again. It’s perfect! I felt awful about the incorrect name on the quilt, so I went ahead and tried another a more reputable translator and went through the process again. This time I just made a super mini quilt and bound it like any other piece. I’m still not sure if the name is right, but I figured the effort would be well received? maybe? I also included a Tardis pin, a Tardis topped pen and a reversible Weeping Angels Necklace I found online. The necklace is super neat! One side is the angel covering it’s eyes, the other side is all evil like. Ugh, I am not a fan of those angels! My partner received her package over the weekend, and it seems like she really loved it! It was so much fun to make and I love any reason to step outside my creative comfort zone. If another one of these swaps ever comes up again, I’m totally signing up ASAP! A couple months ago I signed up for a Doctor Who crafty swap. It was very similar to the mini quilt swap I did back in June. You sign up, tell the organizer your likes, dislikes and more. However instead of basic things, it’s all about what you like, dislike, etc about DOCTOR WHO! The super awesome Rae of Rae’s Making It organized this brilliant swap, and lucky me, she was also the one who got my name!!! I received a package in the mail this past Saturday STUFFED with what you see above and more. First there was the AMAZING mini quilt that featured the very memorable scene from the “Silence in the Library” episode. She free hand appliqued the loose skull in the astronauts outfit, AND to top it off she free motion quilted “Who turned off the lights?” over and over again in the background. It’s so well done, I’m beyond impressed. On the question-ere, I mentioned that I my favorite Doctor Who villain is the Daleks. I have a Dalek toy army I’ve been collecting for almost a decade now. It use to be harder to find the toys, but because of the shows growing popularity, I’m able to buy them more often. Rae ran with this and made me my own unique watercolor and embroidered Dalek to add to my collection. I had watched her make it through Instagram and was so happy its now mine! Also included in the package was a one of a kind watercolor done by Rae placed in a super cute metal frame. It’s already sitting with my Tardis collection! (yes, I know, I have too many collections!) There was also a Cyberman bust that included a tiny book (that will go great with my tiny Tardis book), a comic book inspired Doctor Who mug, a nice pile of cute fabric and a paint your own nutcracker kit for CT (that she ran off with right away). I am beyond grateful for everything that was in the box. This was such a neat swap and I would totally do it again. Oh and I’ll totally share what I made for my partner once she receives it. I was a few days late mailing it, so I may have to wait until next week. Sorry for the Instagram photos, I was rushing all month to get things finished and wrapped and didn’t get the time to “properly” photograph everything! a pillow for my grandmother using the Modern Maples blocks. two Tangled inspired dresses for nieces. I actually made a few other things too, but they haven’t been gifted yet. It was all a lot of fun to make, but I am beyond exhausted. New rule: Start sewing gifts in the summer!!!!! So if you didn’t get the theme, I’ll let you in on it… It’s all nerdy pop culture stuff. I live for things like this. I love showcasing it all in my home, and on myself. I use to hide all my favorite things away, in fear that I would be made fun of. (I watched Stargate SG-1 from the start, when it was aired in the middle of the night, but I never told anyone until my husband) That’s totally not the case anymore. I’m proud of my interests. I love TV. I love movies. I love anything to do with time travel, and I love everything Douglas Adams says… Plus so much more, I just love it all! … A Tardis dress to be exact! I decided that for the first time in 17 years, I am going to wear a costume for Halloween (and any other event that involves a costume, that we may or may not be going to). I would really love to make one if possible, because all of the commercial costumes I’m finding are a bit too little for me. Too little fabric to be exact. I’m a bit modest when it comes to my clothes. I have searched fan sites, google, etsy, flickr and pinterest for some inspiration. I think I may have searched too much, because now I’m overwhelmed with possibilities. I have to take into account my body shape, the weather and what I’ll actually feel comfortable in… Ugh! Have you seen any on the internet that you think I may like? That won’t take me forever to make? I still have to make CT’s costume too! I’m also stumped with hers, more because she can’t decide, not because I can’t make it.